The goal of Marten loudspeakers is to reproduce music that is as close to reality as possible. Of course, Marten is not alone in this, but Marten loudspeakers are constructed to achieve this goal in normal living spaces, and in this, they are virtually unique. In achieving the goal of realism, Marten employs the very highest-quality drivers and electronic components. 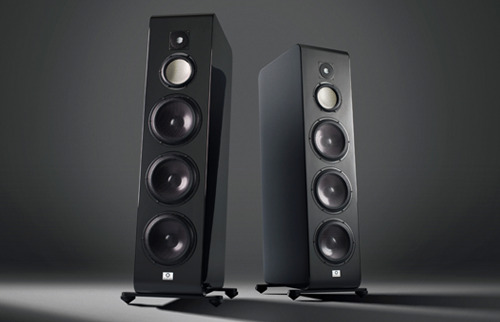 Marten loudspeakers employ the best drivers available today. Most of the drivers used in Marten speakers are made of ceramic. These are the only dynamic drivers that work with a perfect piston movement. That means that the drivers do not have any breakups (flexes) within their frequency range, and have none of the audible distortion that can be found in most other drivers on the market. The ceramic used for these drivers is an aluminum oxide, with a thickness of only 0.15 mm in the midrange and bass drivers, and a mere 0.05mm in the treble drivers. This makes the cones very light, and allows extremely fast and dynamic music reproduction. These drivers have the best of both worlds—the microdynamics and resolution of electrostatic drivers as well as the macrodynamics of dynamic drivers. Distortion masks detail, and because of their distortion-free reproduction, every Marten sounds extremely detailed and transparent. Unless all musical details can be heard, naturalism cannot be achieved. The crossover networks of all Marten are as simple as possible, and use the best components on the market, including robust foil coils, Teflon ring core coils (for bigger values than 3.0mH), polypropylene capacitors from Mcap and MIT, and induction-free resistors from Mundorf. A milestone not only for Marten, but for speaker design in general. Our flagship series uses exclusive materials throughout. Carbon fibre cabinets. Beautifully crafted solid wood work made by Sweden’s finest craftsmen. Ceramic and diamond drivers, with tweeters in pure diamond. The speakers in the Coltrane series are the first to use this combination. The result? Extreme clarity, speed and resolution, and uncannily musical even at low volume. Making the Coltrane Series the ultimate reference in sound reproduction. Back in 1998, our philosophy of simple design and unembellished sound reproduction was encapsulated by our Heritage Series. Today, we’ve retained that philosophy and refined the details, resulting in speakers that deliver a clean and invisible sound source and dry bass. Everything you expect as a true audiophile. This year, the series is upgraded with new bass units, tweeters, feet, cones, pucks and improved and refined crossover. The Django Series is the youngest in the Marten family, designed with our well renowned quality and build, but at a competitive price. Django are perfect all-round speakers; powerful without sacrifice to performance. Django remains true to the Marten philosophy with a new vitality. With our Form Series, form really does meet function. Resulting in speakers which combine stunning design with outstanding sound reproduction. Our aim with the Form Series was to create an entry-level series, which remained true to the open, airy and detailed signature sound of Marten and would fit into the interior of any contemporary home. Dan Meinwald's EAR-USA/Sound Advice imports high-end audio products made by Tim De Paravicini/E.A.R., Marten (loudspeakers), Townshend Audio (turntables & racks), and Jorma Design (cables). Based in Long Beach California, EAR-USA/Sound Advice works closely with these manufacturers to bring the finest audio experience to audiophiles and audio enthusiasts in the United States.